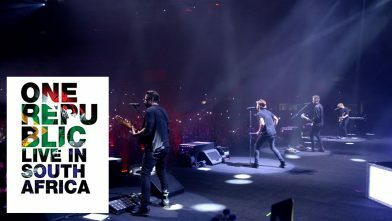 On February 23, the release of the concert film “OneRepublic: Live In South Africa” will be released on DVD, blu-ray and digital download and we have copies to give away to FIVE lucky readers. Details below! This milestone show for the band was recorded live in Johannesburg, South Africa at The Ticketpro Dome (then known as The Coca-Cola Dome), in the closing stages of their Native World Tour. Having been on the road at that point for over two years, the band brought their stadium-ready anthems and muscular live sound to 20,000 fervent fans in an explosion of light and sound; and performed hit after hit with contagious energy, including “Counting Stars”, “Apologize”, “All The Right Moves” and “If I Lose Myself”. Native, the band’s third album which featured the game-changing “Counting Stars” – a #1 hit record in 54 countries – debuted at #4 on the Billboard Top 200 chart in 2013 and sold over 5 million units worldwide. The suitably gigantic Native Tour had the band criss-crossing the planet en route to multiple shows in 154 cities in 26 countries across Africa, Asia, Europe, Oceania, as well as North and South America. The energy of this special concert is complemented with an intimate, all-access documentary which charts the band’s frequently challenging journey, seeing them go from struggling musicians to multi-platinum, award-winning artists and one of the most popular bands on the planet. They reflect on their past and look forward to their future in exclusive interviews and never-before-seen archive video, which is exclusive to the physical formats. A further bonus is the band’s dynamic performance of “Wherever I Go” live from the stunning Sydney Harbour. OneRepublic are Ryan Tedder (a Grammy® Award-winning songwriter and producer whos worked with the likes of Adele, Taylor Swift, Beyoncé and U2), guitarists Zach Filkins and Drew Brown, bassist Brent Kutzle and drummer Eddie Fisher. As previously announced, OneRepublic will join John Legend, Lorde, Harry Styles, Keith Urban and Haim on January 26 to honour Fleetwood Mac at this year’s MusiCares Person of the Year tribute concert. We are giving away FIVE copies of the DVD to our readers. The competition closes on Halloween, 31st October at Midnight, UK time. Good luck!